A high-profile attempt by four well-known adventurers to reach the South Pole by December 14 is seriously delayed. Now it looks like the expedition led by the head of the Norwegian Polar Institute won’t reach the South Pole in time for 100th anniversary celebrations of Roald Amundsen’s legendary success, but another one that’s following a different route might. Nine Norwegian and foreign expeditions have set a goal of reaching the South Pole by the anniversary date of December 14. That’s also when Norwegian Prime Minister Jens Stoltenberg plans to be at the South Pole, and Stoltenberg had even planned to ski the last 20 kilometers with the four men from the Polar Institute. But the men, including former Olympic and World Cup champion skier Vegard Ulvang, reported themselves on Sunday that they’ve been stopped by the weather once again. The first delay came even before they reached Antarctica, when bad weather prevented them from flying onto the frozen continent from their starting point in southern Chile. Newspaper Aftenposten noted, however, that the delay means the Polar Institute’s expedition is now lagging 13-14 days behind schedule and 227 kilometers behind Amundsen. The plan was to make the trek to the pole in 57 days, the same time Amundsen used. Winther admitted that his team now needs strong tailwinds, and no more headwinds, to reach the pole by December 14. Meanwhile, another expedition led by former skater Asle T Johansen is having better luck. 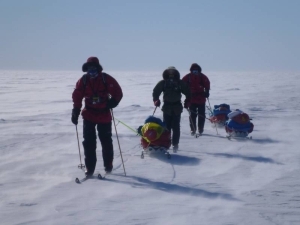 Two of the three men on his team are using the same type of clothing and equipment that Amundsen used, claiming they wanted to recreate Amundsen’s expedition in practice “and spirit.” They managed to cover 26 more kilometers during the past day. They reported on their blog that they had passed 85 degrees south, after starting at 82 degrees, and that the weather where they were was calm with none of the headwinds facing Winther’s team. Temperatures reached as high as minus-5C (around 27F) over the weekend, they reported. Their route was to cover a total distance of 900 kilometers, while the Polar Institute’s route was planned over 700 kilometers. All told, Antarctic Logistics & Expeditions, which the institute said is the only private firm offering service to Antarctica, has registered 60 Norwegians who are trying to either sail or ski to the South Pole by December 14 from various starting points.